Sure, said John, who for decades has cut and coiffed the heads of thousands at his South Blvd. establishment in Pontiac. That’s right, a new year brings new talk of a possible Manny Paquiao-Floyd Mayweather fight, a fight which has been on the horizon for the last four or five years, but only in the last few weeks has been revived with genuine possibilities of actually taking place. This is the fight, pitting Pacquiao from the East (the Philippines) and Mayweather from the West (Grand Rapids) in which half the world wouldn’t mind seeing. If made, this fight could break the bank when it comes to revenue producing opportunities. Even Mayweather, who has been accused of dodging Pacquiao and preventing the fight from happening due to his demands for drug testing and purse splits, has said the time is right for the fight. No contracts have been signed and no date has been set. In fact, a proposed date of May 2 for the bout has already been reserved for a possible Canelo Alvarez and Miguel Cotto battle. That absolutely irks Bob Arum, the former promoter for Floyd Mayweather, who has a hand in that proposed Cotto-Alvarez bout. Mayweather’s audacity to knock heads with one of his fights is dirty business, according to Arum, who also promotes Pacquiao. 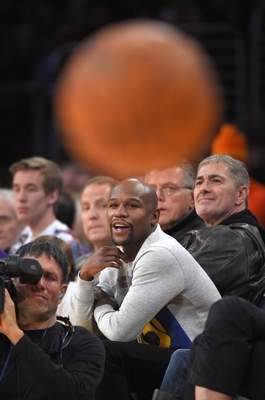 Mayweather the fighter, would like nothing more than to get in the ring and give Pacquiao some boxing lessons. But Mayweather, the businessman — he’s CEO of Mayweather Promotions and a student of the business side of boxing — wants to do it on his own terms, no matter what the cost. He won’t budge. And there’s the rub when it comes to putting a Pacquiao-Mayweather fight together. Mayweather, who has won an armful of world titles in different weight classes, is undefeated with a 47-0 record. He holds the record for pay-per-view buys for a single bout, and, in his last seven bouts, has generated more than a half-billion dollars in gross revenue. His personal take has been somewhere in the neighborhood of around $200 million in the last several years. Indeed, Mayweather, despite his villainous reputation, is the undisputed king of boxing when it comes to accomplishments, financial rewards and influence. So why can’t he be the one who dictates the terms for possible fights, as those with absolute influence have done in the past? He’s certainly earned that right. Arum, who maintains an icy relationship with Mayweather, is resistant to such demands, especially for a fighter who used to be under his control. Mayweather couldn’t wait to get out of his contract with Arum nearly a decade ago and ever since has excelled beyond his wildest dreams. I recall when Emanuel Steward, the late trainer and manager from Detroit who had earned his status as one of the world best boxing trainers, was training former heavyweight champ Evander Holyfield during the early 1990s. That is, until Holyfield lowballed him in the pay department by a considerable amount. Steward said get somebody else to train you. He said that accepting a pay cut would open the door to similar insulting offers. It’s boxing, but it’s business, too. And that’s the way it is in the Book of Mayweather. So, John the Barber, hold off on any travel plans to Las Vegas. Unless Mayweather rightfully gets his way, this fight’s not happening. Marvin Goodwin covers boxing for The Oakland Press. Marvin Goodwin has written stories and columns for The Oakland Press since 1978, and he covers boxing, cross country, wrestling, track, and feature topics. He lives in Pontiac. Reach the author at marvin.goodwin@oakpress.com or follow Marvin on Twitter: @MarvinGoodwin.